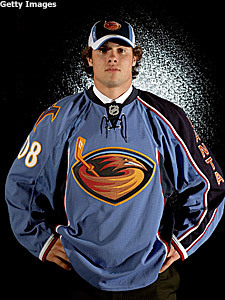 Atlanta prospect Zach Bogosian is working hard in development camp so he can make the Thrashers lineup this season. Zach Bogosian has every intention of making it difficult for the Atlanta Thrashers coaching staff. "I want to crack the lineup," Bogosian told NHL.com. "Working hard in developmental camp and training camp are my top priorities since I'm out to try and make their decision to send me back home to junior a hard one." Based on his eye-opening play at the Thrashers' prospect development camp at the Duluth IceForum in Atlanta from July 8-13, the 6-foot-2, 197-pound Bogosian did little to dampen those expectations. Camp "was a good experience," he said. "I really didn't know what to expect coming in, but it's been a lot of fun just to come down here, meet some of the guys in the system, meet the coaching staff and just kind of see the facilities. I know I'm still young and I have to work my way up, but it's something that I'm definitely going to work hard at. Hopefully I'll be able to play my game while helping the team out as much as I can." While General Manager Don Waddell and coach John Anderson wouldn't publicly make a decision prior to the season, Bogosian, the No. 3 choice in June’s Entry Draft, showed a physical presence and offensive flair throughout the six-day camp. Anderson said Bogosian's skill set and instincts were better than expected, while Waddell said, "We're going to give him every chance to succeed." That's fine with Bogosian, who knows there are aspects of his game that have to improve. "Developmental camp was a crazy week for our coaches with all the players here, but we did have some instructional meetings in the locker room," Bogosian said. "They just tried to stress the importance of playing good, sound defense and to always keep your feet moving. It's something where I'm definitely going to concentrate on adding those aspects into my game on a consistent basis and, hopefully, they'll be satisfied." While the 18-year-old won't go out of his way to throw a thunderous body check, he meticulously picks his spots, and his ability to jump into the play offensively has been well-documented. In 127 games with the Peterborough Petes of the Ontario Hockey League over two seasons, Bogosian has 18 goals, 94 points and 135 penalty minutes with a plus-2 rating. Bogosian ranked second among OHL defensemen last season with 50 assists and was the only defenseman in the league to lead his team in scoring, putting up 61 points. "I'm out to be the best all-around defenseman possible," Bogosian said. "I like to take care of defense first and then chip in offensively when needed. But really, I just want to be a good team player, capable of sticking up for teammates and myself while trying to help out the team in any way." Bogosian couldn't help but reflect on the possibility of one day going head-to-head with many of his childhood heroes in the NHL. "I've trained with Daniel Briere (Philadelphia), Daniel Alfredsson (Ottawa) and Matt Bradley (Washington), and that was something I'll never forget," Bogosian said. "It'll be pretty crazy watching players I admired growing up bearing down on me and playing against them. It'll be a great experience. "At camp, the guys who were drafted really took it to the next level and even though many aren't in the NHL yet, the pace was much faster and the players were a lot quicker and stronger. It's interesting to see where I fit in among the group." It's become apparent that Bogosian has fit in quite well. "I suppose I'm fitting in because the guys around here are starting to call me Chuck Norris," said Bogosian, referring to the martial artist and actor. "I guess they feel I look a little like him. That was the funny thing around camp all week." Defenseman Tobias Enstrom's play during his initial season in 2007-08 with Atlanta certainly inspires Bogosian. Enstrom led all Thrashers defensemen with 38 points, including 33 assists, in 82 games last season. He participated in the NHL YoungStars Game in Atlanta and was named to the NHL All-Rookie Team. "Tobias made a good impression and has really done well for himself and it'll be great to have a chance to play on a team with a guy like that," Bogosian said. "I think the team and fans of Atlanta are really looking forward to moving ahead this coming season, and obviously management has made some changes that we all hope will pay off." Atlanta fans have high expectations that Bogosian will play a key role in that future success.